As many of you will be aware, I have been working on a rendered aircraft set for the last several months. Well, v1 is complete and now available. The set features new takeoff and landing sounds, animated landing gear and flaps, and aircraft slowing down before landing (yes, that's right, no more concordes hitting the ground at 1,400mph!). Many thanks must go to stevenh for writing the patch code for that last feature. Anyway, enjoy, and please let me know if there are any errors (hopefully there aren't, but something always slips through...). The set should also work with OTTD 0.5.x, although you won't get the slowing down effect. Last edited by PikkaBird on Sat Apr 25, 2009 3:19 am, edited 15 times in total. Jolly good work! I'm glad you put in the Constellation. Quite a bird, indeed! A definite download, for sure! Imagination! Here, you learn what it is to be human. You are a creator of order, of beautiful shapes and systems, an organizer of chaos. Oh very good looking planes. Larger and in duel colours. Lovely. Good Job Pikka, I'll try them when I get Cygwin installed properly. WOW!!! This looks awesome! And I really like the aircraft graphics! Very well made! You need to update me on the renderness of this set, Pikka. It sure looks great and I'm very curious to see it in action. Oh my god. Seeing the whole set looks amazing. Thanks Pikka for being amazing as always! Only I can not get used to such scale. Too it wanted to me to try to draw white planes. OK Pikka! Now you've done it! I'm going to have to add 3 hours to all my clocks to make sure I have time to try this. Pikka, very nice. I've been enjoying this set for a few months now, I especially like the climbing after takeoff. Very nice. 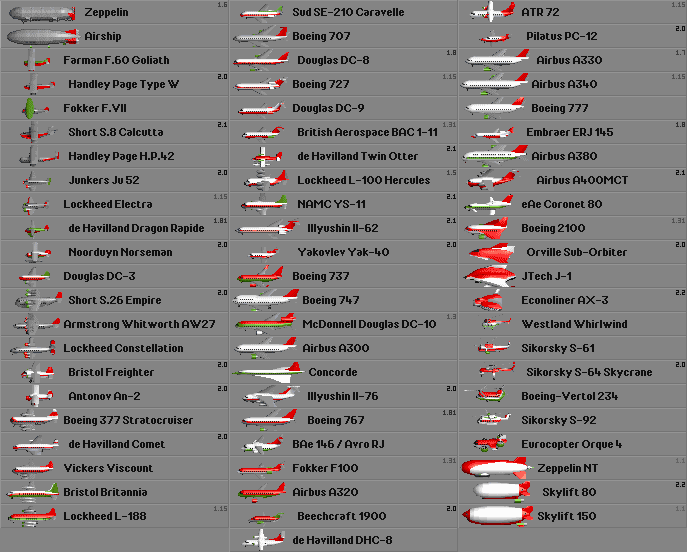 I just have a small question, which is in no means a criticism; where is the 787 and A350? I just have a small question, which is in no means a criticism; where is the 787 and A350? Hooray, one of my frequently asked questions (the fifth one) has actually been asked! BTW, I was right; there is at least one graphical glitch, and at least one statistical glitch, in the release version. I guess there'll be a 1.1 shortly. But I'll wait a while and see if any more problems come to light first. it certainly looks more than impressive. it's almost a damn shame i never (or rarely) use an aircraft. actually, i didn't expect anything but high standards from you anyway, pikka. i'm sorry, but you just pushed your own limit. brilliance. Eee! I didn't realize there was a website, my apologies. Fair enough, I suppose things like carbon-fiber fuselages make little difference in TTD game play. How much cookies do you want? 3? 4? 15? 120? You can have them all!